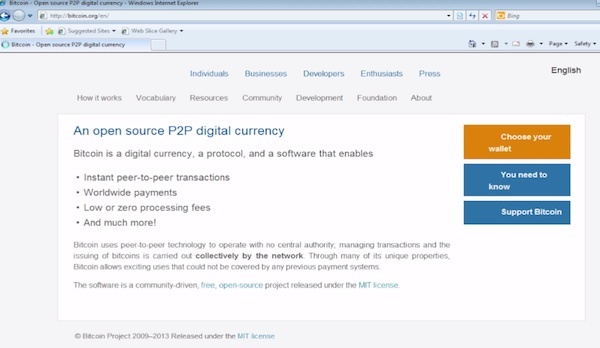 In this tutorial, you will learn how to buy Bitcoins. Buying Bitcoins is relatively easily, especially if you have done any Bitcoin acquisition in the past. The first thing that you need is a secure online wallet. Several sites provide you with this, and we’ll use one of them. Open up a browser and go to bitcoin.org. You are presented with a range of applications that offer the wallet function amongst others. Our choice is Multibit. Download and install the wallet executable if you didn’t have it, otherwise launch your digital wallet application. Alternatively, you can use a web wallet on one of the many sites that provide it. The next thing you need is to get an address. In the Multibit application, click Request. A new address is generated for you. Copy that in the clipboard. Think of it as a bank account: give it a name. We’ll call it learning expenses. You are presented with a fast integrator of Bitcoin transfer. Let’s see it in action. Change the country to Virgin Islands, either British or US. Select Moneygram as point of collection. From “Pay to” menu, select Bitcoin address. Paste the previously copied address in the below field. Fill in the others. Resolve the captcha, then click on “Send funds”. Result: Congratulations, you have just bought your first Bitcoins online!